Check out TouchLight technology from Microsoft – 3D images that you can manipulate with your hands (like Tom Cruise did in Minority Report). Good News – Things are Getting Worse! The article explains itself nicely: Basically, when the economy grows at a slower rate, there’s less inflation, which means the Federal Reserve doesn’t have to raise interest rates. This keeps corporations’ costs for borrowing money from going up, which suggests higher profits in the future, so the stock market goes up. 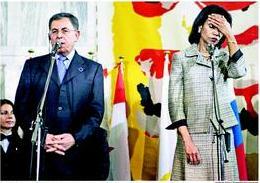 Condi Rice met yesterday with Lebanese Prime Minister Fouad Siniora to try and mediate the armed conflict raging between Israel and Hezbollah (and, by extension, Lebanon). 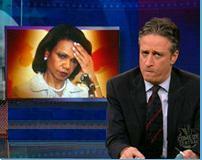 Last night, Jon Stewart of the always-funny Daily Show ran this rather unflattering picture of Condi, and compared her facial expression on what he called the “Condi-meter” to determine how badly things were going with her negotiations. It was very funny and, in my opinion, entirely appropriate. He used an awkward picture of a public official to make light of a very serious situation, and a good time was had by all. Then, this morning, I see this picture on the front page of the New York Times, alongside the headline CEASE-FIRE TALKS STALL AS FIGHTING RAGES ON 2 FRONTS. This time, it’s not as funny, and certainly not as appropriate, unless Condi was making that gesture in response to a question like “How are things going?” which strikes me as highly unlikely. A much more likely scenario is that this was just one of those unfortunate moments we all have that happened to get caught on film. When Jon Stewart takes advantage of it for comedic purposes, it’s well played. When the New York Times takes advantage of it for dramatic effect, it’s at best misleading. To drive home the point, here’s another picture from the same press conference that I found on the web from another news outlet covering the same story. Judging solely from the picture, things look to be in much better shape here, don’t they? It was very good but lacked some the punch of a true, fresh pie. We’ve ruled out the frozen option and believe it puts each contender into a position where they feel they have an inferior product. Yes, that’s right. He said “contender.” He’s also running test trials. I plan to begin my training by, you know, eating some pizza. It’s rough, but if you’re going to compete at this level, you have to be prepared. – My suggestion was we get the local ABC affiliate to recruit someone in New York to help me out. If I walk into a pizza joint with an actual TV person, I think we stand a better chance of the store manager buying into the idea. – In what I can only describe as a flourish of overconfidence, Dave has also mentioned that there’s a pizzeria in Cincinnati that he wants to challenge next. Apparently, our little show is fated to become a nation-wide tour. Here’s my question, though: if you prevail in New York (Hah! ), what do you prove by prevailing in Cincinnati also? And if suffer the agony of defeat that most certainly awaits you in the Big Apple, how much of a consolation would it be to beat up on poor Cincy? And, of course, the main questions: in the unlikely event that you prevail in New York and lose in Cincinnati, am I really going to go through this again with a pizza maker out there? Will ABC cover it again? At what point does this go from a segment on the local news to our very own reality show? UPDATE: Momentum fades, but hopefully only briefly. Here’s the latest status. The Pizza Challenge Heats Up! I met with Dave [the owner of Este pizza] today. He’s very excited and is in fact brainstorming with his cooks at this time to figure out the best way to prepare the pie for shipping. He’s wanting to go up against the best there is in New York so this should be a blast. I pitched it to my local ABC affiliate here and they love it and want to do a segment for their morning show. The program director will also look into contact Regis and Kelly as well since they’re ABC as well. - Este is a go. - We need to decide on a type of pie and the best way to send it / comparable pie to be cooked with it in one of the top locations in Rockefeller area. - Blind taste test with local NY’ers as to which is the better pie. - Sit back and wait for all the news stories to roll in… see what you started? OK, so first of all – cooks? Plural? How many cooks does it take to make a NY style pizza? Each guy in Manhattan makes a few at a time during the lunch rush. I’m starting to wonder just how serious these Utah folks are about their pizza. UPDATE: The next installment is available here. InternetWeek has published a State of the Spam article, in which they claim that 80% of all e-mail traffic during the first three months of 2006 was spam. Moving on to idea number two: we’re going to try and have the pizza delivered to my office in Rockefeller Center, home of the Ice Rink, the Christmas Tree, the Today Show Studio, and NBC World Headquarters. I will see if I can convince a local pizza shop (there are something like twenty of them within spitting distance around here) to warm the pizza up in one of their ovens, so we can do a pie-to-pie comparison in an honest-to-goodness New York Pizzeria. UPDATE: Apparently, I jumped too quickly to the Late Night mode. It seems ABC considers this worthy of their morning show (yes, I’m serious. Why do you ask?) and are even considering talking to Regis & Kelly about it. Read the details here. The Great Simple Tricks Pizza Challenge! Long story short, Jason’s friend has agreed to reach out to the pizza store owner (Dave) and have him send me a pizza. He even plans to create a short film about it. My role is to eat said pizza, and blog about the relative similarities/differences to a genuine New York pie. As am I, Jason. As am I. President Bush – Founding Member – Upsilon Sigma Alpha? Detractors of the President saw a golden opportunity to paint him as an immature frat-boy, but the general reaction of most people was lukewarm. If anything, people seemed refreshed by this rarely seen, unrehearsed reaction of a politician to troubling world events. Daily Kos took the meme one step further, by pulling some screen captures from another meeting, in which President Bush walked into the room, put his hands on (German Chancellor) Angela Merkel’s shoulders and gave her a faux-massage. Kos called it a “frat-boy prank” and said that Merkel was “not amused.” Many of his commentors called it groping, a violation of her space, sexual harassment, etc. In my opinion, the two are obviously friends, and both had a good laugh at a meaningless incident that neither would remember unless they saw the video. Your mileage, of course, may vary. I decided to test the Celebrity Face Recognition program that I blogged about yesterday, so here’s what I did: I went to the Forbes.com Celebrity 100 list and pulled off a bunch of celebrities from the top of the list. Then I went and found a good picture (full frontal face shot) on Google Images and fed it to the Face Recognition software. Ideally, it would match the celebrity with him/herself given that it’s, well you know, the same person and all. Picture I Uploaded – Highest Percentage Match (Percentage) (if not a match, whether the match occurred in any of the suggested celebrities – and if so the percentage of the actual match). I particularly like Bill Gates for Elton John, Mel Gibson for Simon Cowell, and Emma Watson (?) for Bruce Springsteen.